Just like humans, leopard seals all look different. The most distinguishing features are spots, which are unique to each seal. Additionally, some seals have scars. Occasionally, you may also see flipper tags or brand marks. 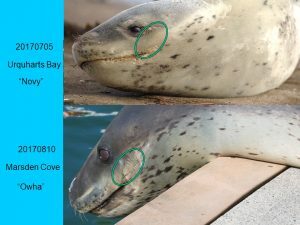 In the example below, the circles show a scar on the face of ‘Owha’, and different patterns spots between the two female leopard seals.